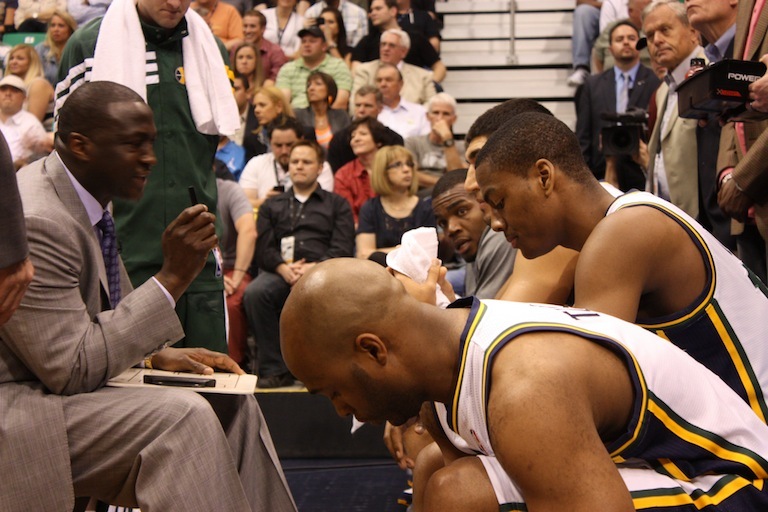 A closer look at the game between USA and Lithuania on August 4, 2012 in the 2012 London Olympics reveals helpful data for coaches looking to improve their half court offense against a zone defense. Only two days prior, Team USA set an Olympic record with its 83 point win over Nigeria, shooting a scorching 63% (29 of 46) from the arc in the process. That hot shooting continued in the first quarter of USA’s game against Lithuania as USA dropped 5 of its 10 3-point attempts, putting Team USA on track for a 132 point game. That changed quickly, though in Q2 where USA was only 1 of 10 from the arc and Lithuania was +4 for the quarter. What changed? I decided to sit down and watch the USA vs. Lithuania game with a pen and sheets of paper and see if I could understand this game better. 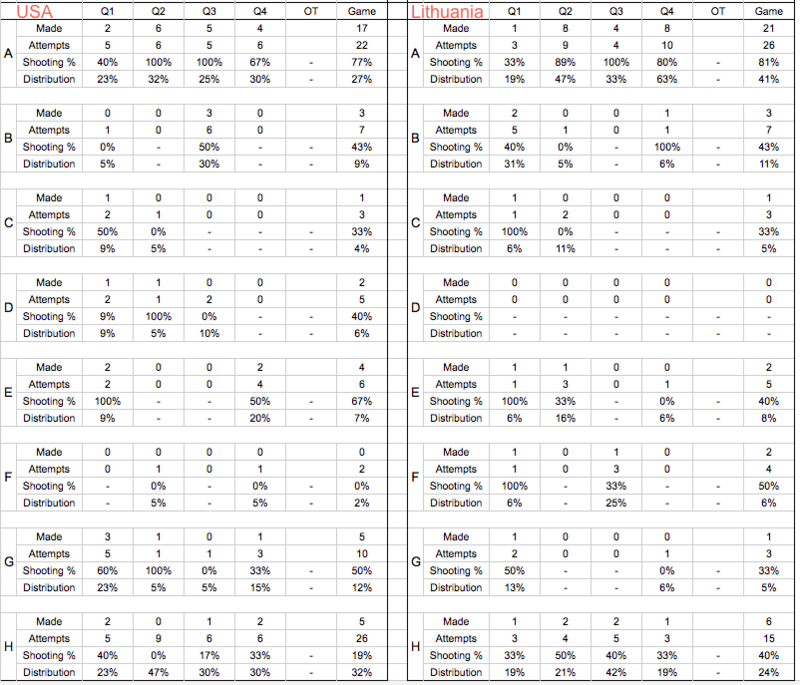 By the way, I have broken down games at all levels including youth league games, NCAA basketball games, NBA playoff games and Olympic games, and my findings are remarkably consistent at all levels (so move without the ball people!). We need to have a common vocabulary before we can talk about this analysis. I have divided up the half court into 8 locations. USA shot 27% of their shots from A space, while Lithuania shot 41% of their shots in A space. That’s quite a difference, isn’t it? In fact, as the table below shows, Lithuania played with remarkable discipline, taking advantage of locations that gave them the best chance of winning. 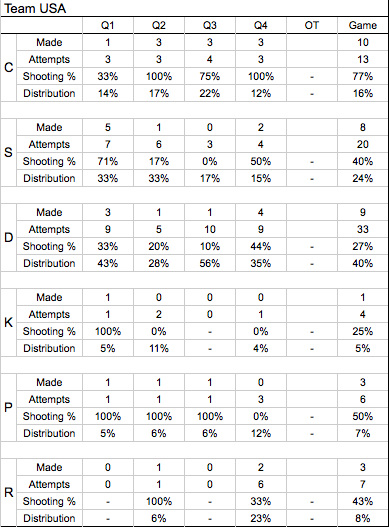 While studying shot distribution amongst varying locations is telling, shot selection gets really interesting when we look more closely at how the shots were created. #1. Shooting percentages drop 1 percent for every 1.5 feet an NBA player is from the rim. #2. Contested shots lower a player’s shooting percentage by 12 percentage points (e.g. from 50% to 38%). #3. Shots created off a pass, (a.k.a. 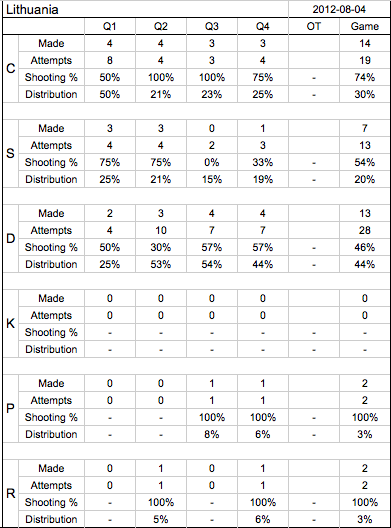 “catch and shoot”) have a higher percentage of success than other shots, even if the shot is closely contested. I wonder if Lithuania was influenced by these 3 findings, because Lithuania’s game plan against the USA was very different from how the other teams in the 2012 Olympics played USA. 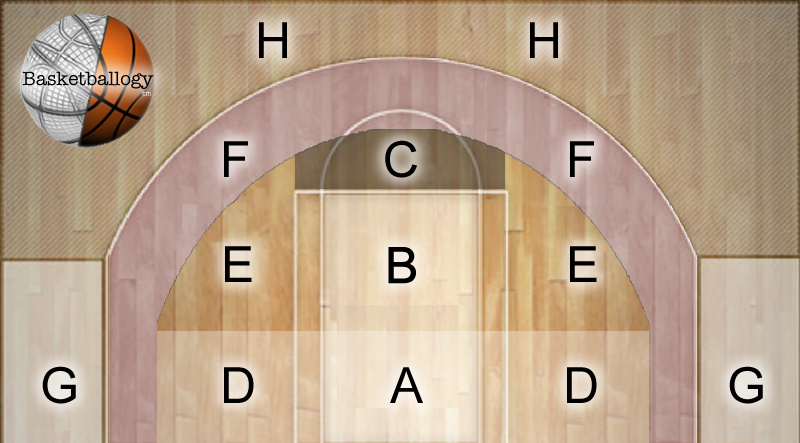 These tactics resulted in very high shooting percentages all game long for Lithuania. After the first quarter, Lithuania was shooting 55%. After the 2nd, Lithuania was shooting 58%, after the 3rd: 62%, and Lithuania shot 59% over all for the game. I have spent countless hours developing, testing and developing again several models for categorizing shot creation. I like the simplest model because I can capture data at game speed on a piece of paper while watching a game live. 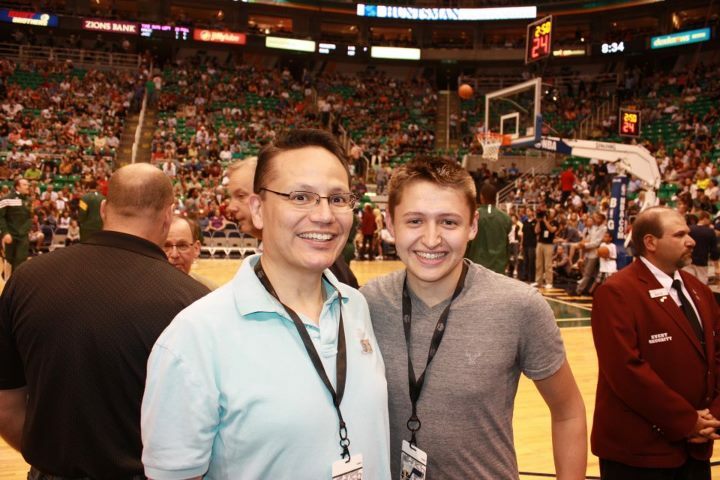 You can’t miss me in fact, I’m the only person you can spot sitting courtside at midcourt between the Jazz announcers and the Jazz bench, with his son… and with a clipboard and pen. o USA shot 77% when they shot off of cuts, but only 16% of their shot attempts came off a cut. o 40% of USA’s shots were off the dribble, where they had only a 27% shooting percentage. In other words, USA did very little of what was working best for them (cut, catch and shoot) against Lithuania’s zone, and they did a lot of what didn’t work very well (shoot contested 3s, and shoot off the dribble). Likewise, USA did the same thing with shot locations: they shot a lot from where it wasn’t working (44% of their shots came from 3-point land where they shot only 30%), and didn’t shoot as much as Lithuania from A space where the percentages are good. No wonder USA struggled: they made the game harder for themselves than they had to. o Like the USA, Lithuania had a very high shooting percentage shooting off of cuts (74%), however Lithuania nearly doubled USA’s percentage of shots off cutting (30%). o Lithuania did not even attempt 1 Keep and Shoot shot the whole game. If a player didn’t have a good shot right away, he moved the ball. o Lithuania shot very well from Spot Up catch and shoot shots. Then again, the lion’s share of those shots were in E space. o Lithuania also shot surprisingly well off the dribble. Couple that with the fact that 41% of Lithuania’s shots came in A space, and you realize the shots off the dribble were successful because many of them were layups. Additionally, Lithuania’s dribble penetration went deep and caused USA problems, especially because Lithuania moved the ball so well. o Speaking of moving the ball well, USA averaged 3.1 touches per possession, Lithuania averaged 3.71.
o Also, Lithuania had exactly twice the number of assists per shot attempt as the USA (0.32 vs. 0.16). It appears that Lithuania compensated for its Capability Disadvantage with Acumen, Effort, Spacing, Ball Movement and Player movement. o Lithuania was +5 in rebounding, partly due to the fact that Coach Krzyzewski played a small team a lot consisting of: Chris Paul at the point, Derron Williams as shooting guard, Kobe Bryant as small forward, Kevin Durant at power forward, and LeBron James at center. o Perhaps the single biggest factor in this game is that USA was +14 in overall shot attempts, thanks to the 23 turnovers their defense created. The extra shots at the goal compensated for the poorer quality of shots they were taking overall. o USA was also +16 in free throw attempts, but again failed to capitalize on its advantage, shooting only 61.3% from the line. Three-point shooting did not win this game for USA against Lithuania’s zone. Cutting, catching and shooting was by far the most effective shot created — for both teams. Lithuania stayed in the game by creating shots that were just more effective, including shots in A space and shots off a cut. USA’s defense forced Lithuania into 23 turnovers. Without those extra shot attempts, it is unlikely that USA would have overcome its poor shot creation and free throw shooting. Team USA had 4 players that were in the 2012 NBA Finals (LeBron James, James Harden, Kevin Durant and Russell Westbrook). USA had the reigning NBA Defensive player of the year (Tyson Chandler). USA had last season’s NBA steal’s leader (Chris Paul). USA had a player that has been voted to 12 NBA Defensive teams (Kobe Bryant). While we all drool over USA’s fire power, and rightfully so, in the end it was USA’s defense, which forced Lithuania into 23 turnovers (USA had 9 for the game) that won the game. USA had more shot attempts (+14) to compensate for their poorer quality shots and shooting percentage. For us coaches, that is a reminder that there are only 2 ways to win at basketball: shooting percentage and shot attempts. A smart coach teaches his team to get advantages in both. When it comes to beating a zone too many people think: shoot 3s and hope they go in. However, hope is not a strategy. One of the very best ways to beat a zone is to score before the zone gets set: in other words, the first thing we should do to beat a zone is to play better defense than they do, and run! 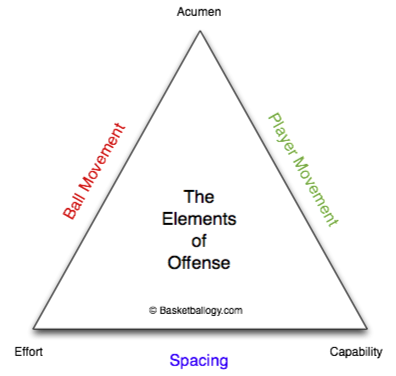 And when you can’t get early offense, use your half court offense to hunt smarter shots. Coaches: I hope seeing those shooting percentages next to cut, catch and shoot shots makes you consider finding opportunities for cutters in your offense. Players: you cannot create a cut, catch and shoot shot if no one is cutting, so move without the ball!